It all starts early (I was awaken in the middle of the night by canticles of all sorts). 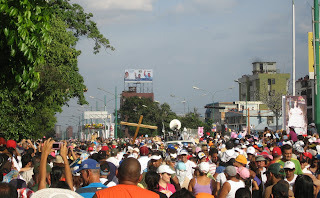 At 8 AM the crowds already throng the Santa Rosa church (I did not go, watched all on TV until it became clear that the procession was reaching our neighborhood so we had to go get a viewing point). There is a well attended mass (with the who'swho of Venezuela politics, minus chavismo who limits itself to the local mayor Amalia Saez). 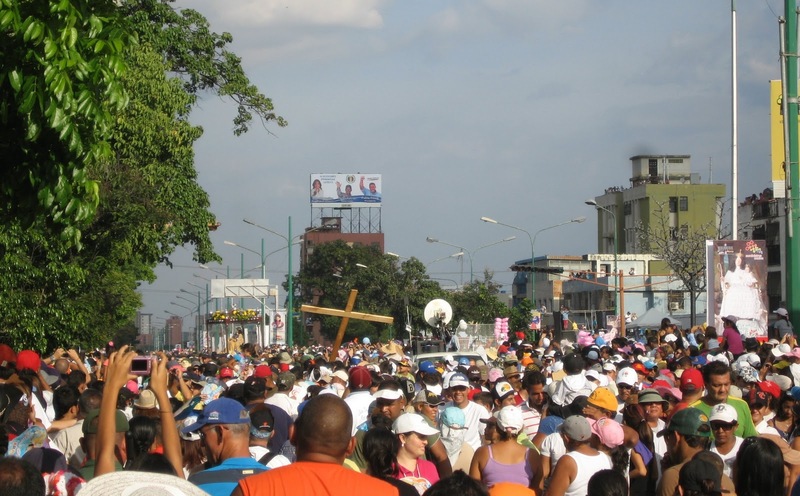 Then at 11 AM the procession starts to cross all of Barquisimeto until it reaches the Cathedral where another mass is held around 6-7 PM. On the way the image stops in front a few churches where it faces them and is inclined in salutations. All very pagan if you ask me. 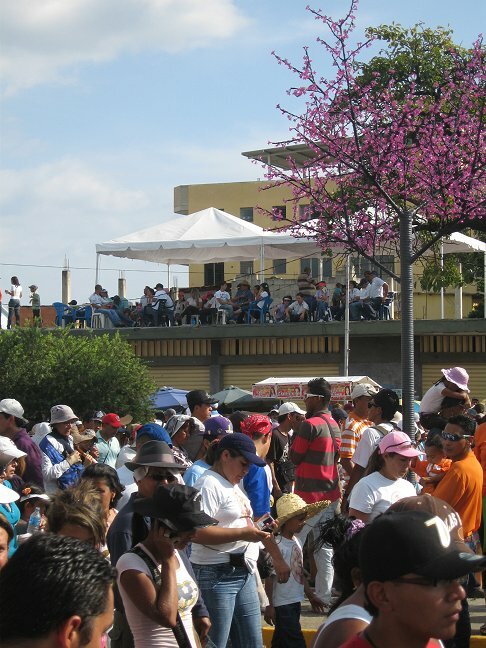 But if I am at the same time impressed and nonplussed, I cannot fail to observe the crowds, from rich to poor, from black to white, all are walking for hours in perhaps the biggest show of national unity that we can think of (La Chiquinquira and Virgen del Valle are rather local affairs even if well attended, and La Coromoto is simply too far from big cities for any good use). 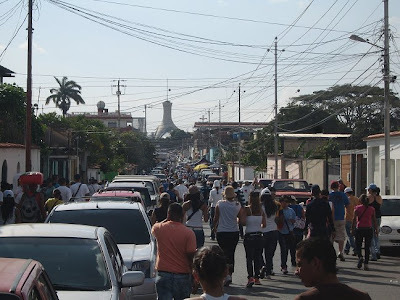 If more than one of you are driving you can make the round trip in the day, thus allowing maybe 2/3 of the Venezuelan population reasonable access, the more so when the 14th falls on a Saturday like this year. There is no loud noise except for fireworks welcoming the image on occasion. There is no gaudy displays like at La Guadalupe though some will carry a cross and do it barefoot. All is peace and harmony, even crime taking a break. 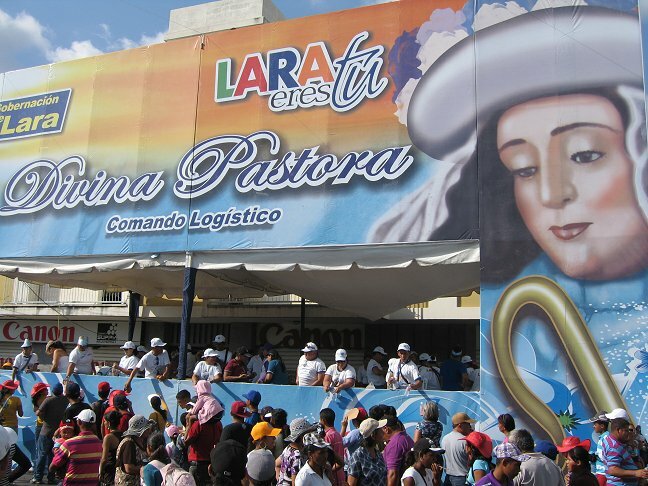 And better, there are so many people and business that must feel that they have sins to be forgiven that you have all sorts of stands along the way where bottles of water and fruits and even sorbets are given away for free (I put above one of the Lara state stands). The rather calm atmosphere still does not stop some to improvise subdued rooftop parties. The arrival of La Pastora becomes of course the big moment wherever it catches you. In the picture in the right you can start to see on the left side the glass canopy and one of the penitent cross (they tend to show off as close from the venerated image as possible). And you can also thus appreciate the density then. Avenida Venezuela where I am standing has 4 central lanes with an island, and two extra islands which separate 2 more slow lanes and the parking areas. All is packed. 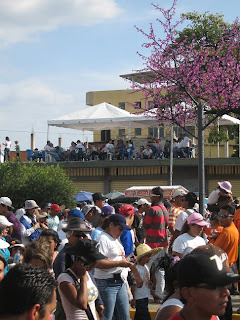 I am not sure there were really 3 millions as organizer and TV claim, but I have been in enough gigantic marches in Caracas or Washington DC to tell you that this is the biggest one I have ever been and thus the million barrier is amply crossed and I am willing to believe that the 2 million one was also crossed. In my first short clip below I am standing in the isle and filming a panoramic so you can see the flow and the variety of believers walking. 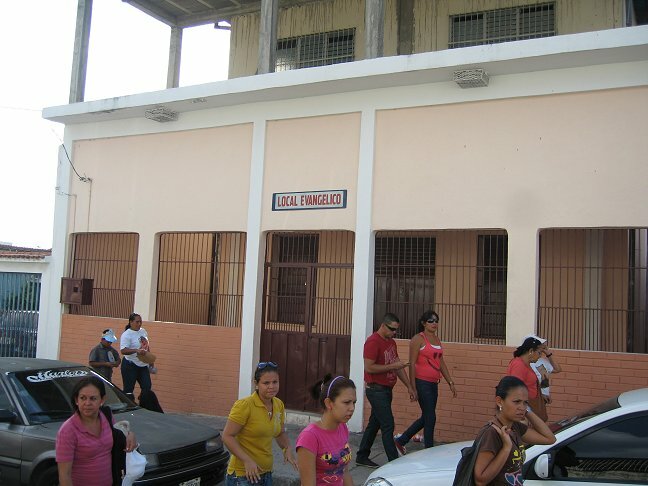 That video was at least 45 minutes before La Pastora arrived! In the crowds of course celebrities are seen. I saw two. 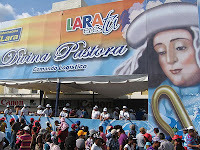 The first one was Lara's governor, Henri Falcon, but I was not ready and I could not take a picture (try to run to catch up in such a crowd). One thing I had plenty of time to notice: he was walking with at most a half dozen people, NONE looking like a body guard (though I am sure that a couple of them must have been). The thing is that the governor of Venezuela's 4th state walks the procession in full like anyone else, un-heckled, greeted and even welcomed by anyone in spite of his supposed betrayal of Chavez. People pointed out to me that neither the Barquisimeto mayor nor big chavista wigs dare to pull such stunts these days !!!! Another celebrity that I did catch was Leopoldo Lopez below, carrying on shoulders his daughter, and surrounded by a lot of admirers though also walking without body guards or even a tight group of folks. Another one that has no problem with the crowds. But the crowds and the identification of the regime with "security forces" also give a bad taste to the whole thing. Indeed, some form of security is needed as the Madonna circulates least overzealous worshipers make it capsize (she is carried by hand all along the way by people fighting hard to be awarded the honor to carry her a few yards). Thus you see this sorry image a few instants before she crossed in front of where I stood, a see of drab olive green (imposed by our alliance with Cuba, by the way) parting the crowds. Below there is my second clip of the day, the moment the glass case of the venerated image walked in front of us. The sound is not too good, but try to pay attention and uses your imagination to perceive the "long live" and other vivats of the crowd as the image rolls by. Last but not least, an evangelical congregation house closed for business. On a Saturday afternoon these omnipresent places of worship and reunion are open but today they decided that it was not worth the aggravation. 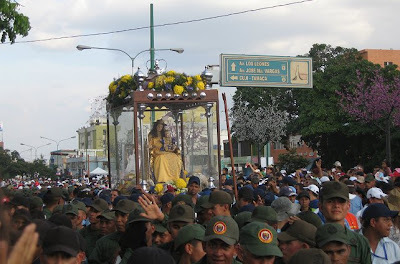 So at least one day a year in Barquisimeto the Catholic Church still carries the day. 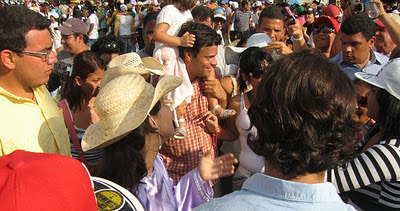 PS: the other Marian stunt will be written tomorrow, about Maria Corina Machado calling Chavez a thief.